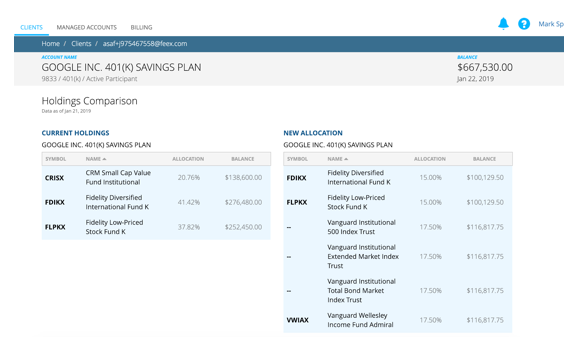 For the first time ever, advisors can manage and trade held away accounts just like they do with custodied accounts. Create a new revenue stream and boost client happiness with this innovative service. 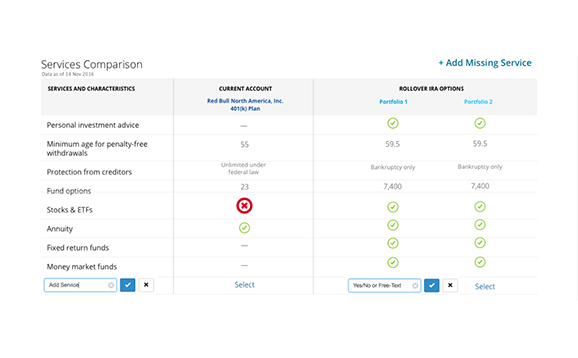 Launch a fully white label Fee Analysis platform to help you acquire new customers by comparing their held away accounts with your unique offerings. Be compliant with the most recent regulations when evaluating rollovers. 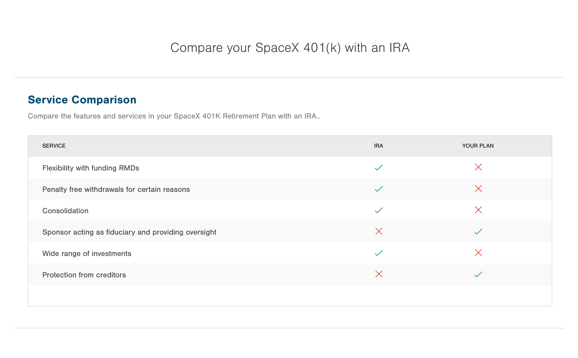 Our proprietary ever-growing database of retirement plans fee disclosures and personalized analysis algorithms provide all the data you need to make and justify the right decision. Provide clear, objective, and personalized guidance when participants terminates service. Enabling greater control and retention of assets. 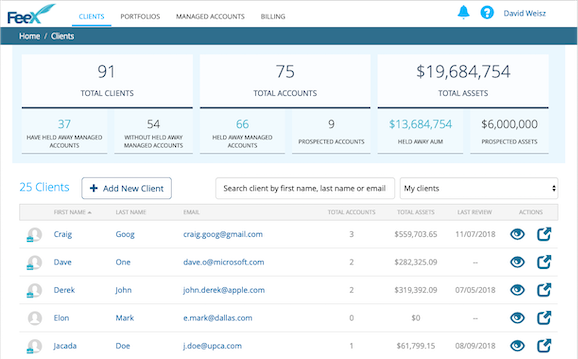 Manage held away accounts the way your clients really expect. 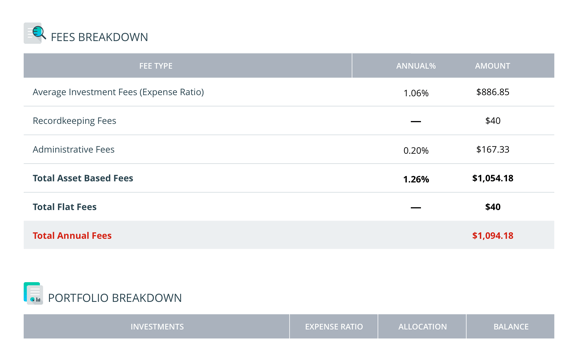 FeeX's Held Away Order Management system allow advisors for the first time ever to manage and trade any held away account just like they do with custodied accounts. Capture and convert leads by leveraging our white labeled and fully customizable fee analysis platform. Show a prospect exactly what's happening in their held away accounts and whether they can do better by switching to your firm. Enable your advisors and team to sell in the field instead of spending their time processing paperwork, while keeping compliance and supervisory in control. Obtain greater control on asset outflows when participants terminate service by providing clear guidance about the options available to them. Leverage the opportunity by highlighting your services and benefits at the moment of intent. Managing held away accounts can increase an advisor's AUM by an average of 33% while allowing you to deliver the level of service your clients expect. 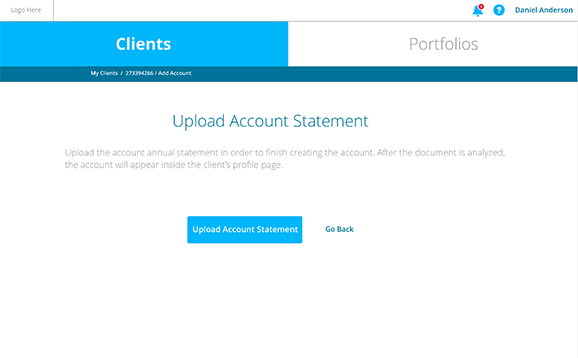 Trade held away accounts just like you do with custodied accounts, all through a single interface. Instruct FeeX to communicate a sell, buy or hold order to any type of account. The FeeX Held Away Order Management System helps you keep in compliance with various financial regulators and alleviate custody challenges on held away assets. 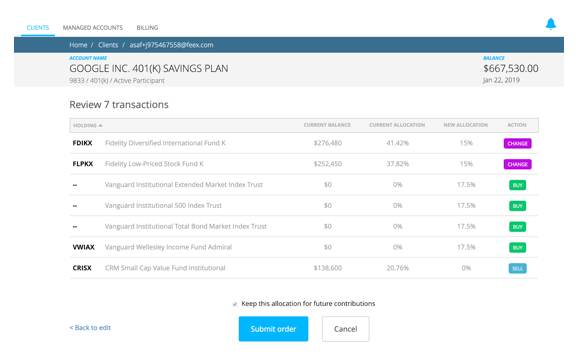 Engage leads with an educational, personalized fee analysis of their investment and retirement accounts while highlighting unique insights including the use of proprietary funds, plan level fees, 12b-1 fees and more. 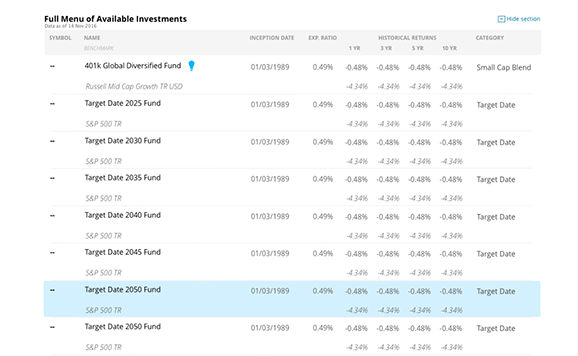 Compare your prospects current portfolio to a similar portfolio at your firm. 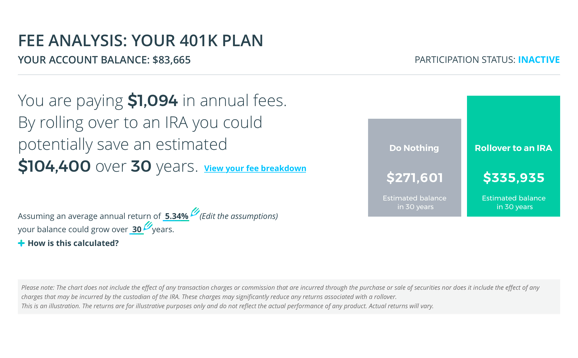 Most Americans believe their 401k's are free, and are shocked when they discover that fees can eat away ⅓ of their nest egg. Surprise 80 million households by showing them their true investment and retirement account fees. 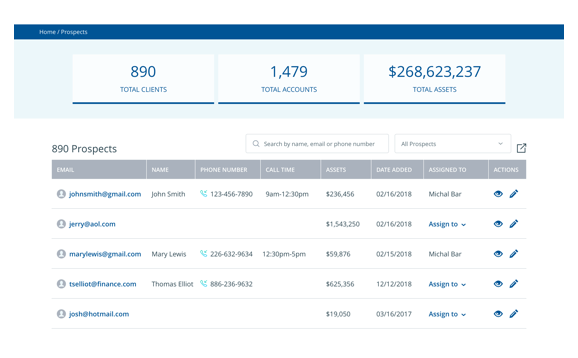 The Fee Analyzer seamlessly integrates into your CRM, boosting associates productivity when speaking with prospects. Customize any screen or text to make sure it's on brand. 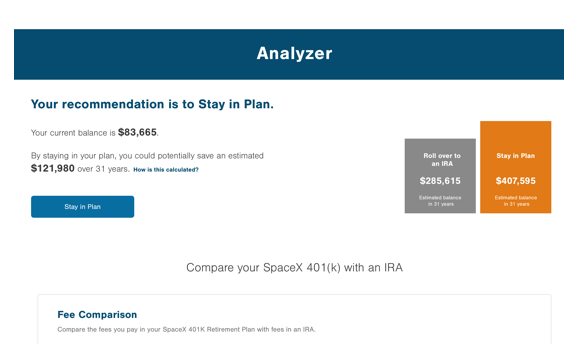 Leverage FeeX's expansive, ever growing database of retirement plan fee disclosures to compare retirement plan services and fees before recommending a rollover. Stop the manual work of deciphering client's statements. Instead, send them to FeeX for an automated and accurate analysis. Clear and objective guidance in evaluating options and opportunities for clients to retain assets in house. 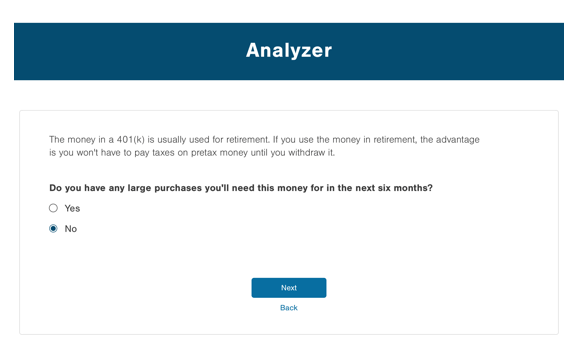 Capture held away assets by encouraging participants to analyze their old 401k's when enrolling and providing a personalized consolidation comparison. Keep plan sponsors happy while staying competitive on RFP's with this service. Learn how we can help you achieve greater financial outcomes and why industry leaders choose FeeX. © Copyright 2019 FeeX Inc. Enter your credentials to sign in to FeeX's platforms. Please choose a new password to finish signing in. Password length must be between 8 and 40 characters. Learn how we can help you achieve greater financial outcomes and why leading companies choose FeeX. A FeeX team member will be in touch soon.